Our targets this time are two galaxies in the constellation of Ursa Major, part of which makes up the famous asterism of the “Plough” or “Big Dipper”. 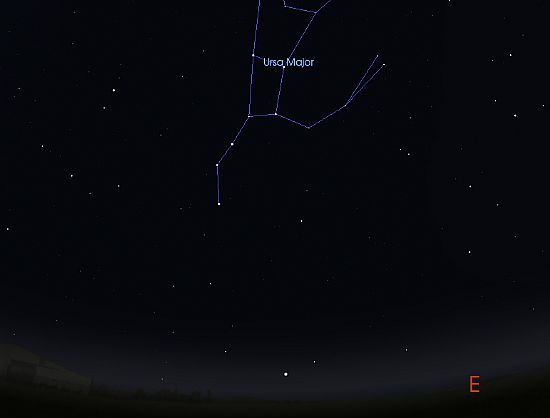 Ursa Major (abbreviated as UMa) is a large constellation currently in the North Eastern sky at around 20:00, and is very easy to find using the Plough asterism. Image 1 shows a wide view of the North Eastern sky for this week, at around 20:00, and you might immediately notice the pattern of bright stars forming the shape of the Plough, or Big Dipper. This asterism is extremely useful as a “celestial signpost” - its stars can be used to point us to other constellations and objects of interest. This week we’ll use two stars in the “bowl” of the Big Dipper to hop to our target galaxies. Locate the “bowl” of the dipper using Image 1, and then use Image 2 to identify the star in the bottom right corner of the bowl - this is Phecda, Gamma (γ) Ursae Majoris. We then move diagonally up to the opposite corner to find Dubhe, Alpha (α) Ursae Majoris. Now that we have an imaginary diagonal line between these two stars, we’re going to extend that line in the same direction, for about the same distance, beyond Dubhe. The patch of sky we end up in might look rather empty with your eyes, and even with the aid of your binocular depending on your observing conditions. Keeping your eyes fixed on the area found with the star hop, raise your binocular to your eyes and give yourself a moment to “take stock” and note what you see in the view. 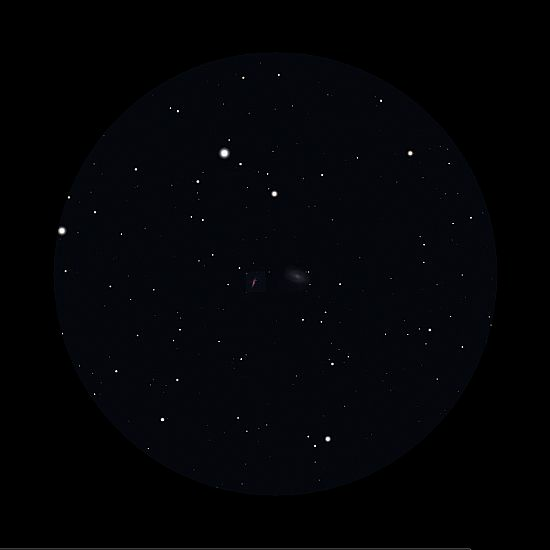 The two galaxies are faint, but should be easily visible in all but the very smallest binocular - Image 3 shows what to expect with a 10x binocular. The galaxies are fairly close together, and will appear small. Image 4 shows the same binocular view with the galaxies labelled. Messier 81 is known as Bode’s Galaxy and is classified as elliptical - indeed the elliptical shape shows very well even in binoculars. The second galaxy, Messier 82, is known as the Cigar Galaxy, and you may immediately realise why - the galaxy appears as a thin, grey ‘cigar’. 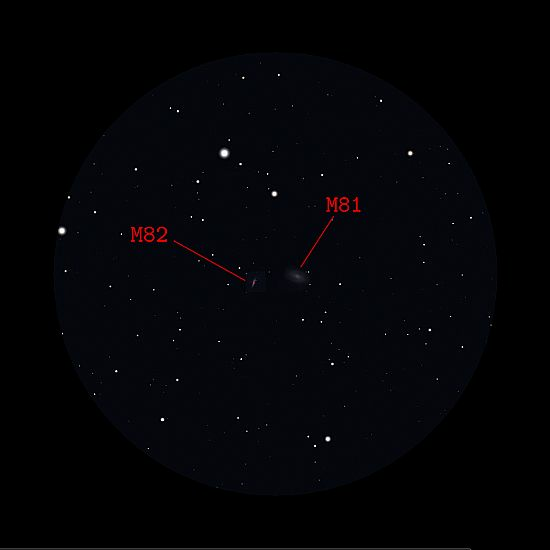 M82 is classified as an irregular galaxy, and stands in great contrast to the sprawling elliptical form of M81. These galaxies are some of the most distant objects we’ll look at in this series, at around 12 million light years (70,543,504,000,000,000,000 miles!) from Earth. As you gaze at these two objects, consider that you are looking at them as they were 12 million years ago - the light has taken that long to reach your eyes. Indeed, astronomical observation is the nearest we can currently get to time travel! Each of these galaxies consists of millions upon millions of stars, along with interstellar gas and dust, gravitationally bound together in space. It is worth saying that if you are unsuccessful in your efforts to locate this galaxy pairing, do not give up - this can be a difficult star hop. Relocate the two guide stars Phecda and Dubhe and draw out your imaginary line once more. 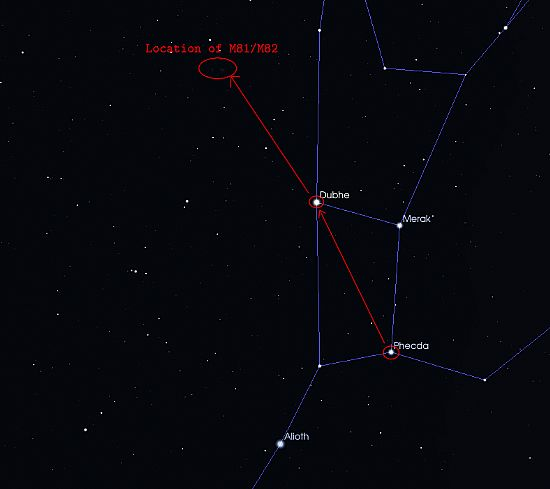 Some may find it easier to use the binocular for the process - locate Phecda in the field of view, and then move the binocular up to center Dubhe, before repeating the same motion to arrive at M81 and M82. The galaxies should just about be visible from light polluted areas, but if you’re having difficulty consider attempting this week’s targets from a darker sky. The Moon shouldn’t present too much of a problem this week as it rises late in the night (around 23:00 for the beginning of the week), so get out there and start hunting down those galaxies!